Healthy Communities in Columbus, Indiana, is an established coalition dedicated to engaging residents and partners in building healthy, vibrant places. Through Plan4Health, the coalition focused on increasing daily physical activity. Project strategies included bridging policy adoption and implementation, collaborating with city planning to design and implement bicycle and pedestrian plans, and promoting community design that encourages healthy, active living. 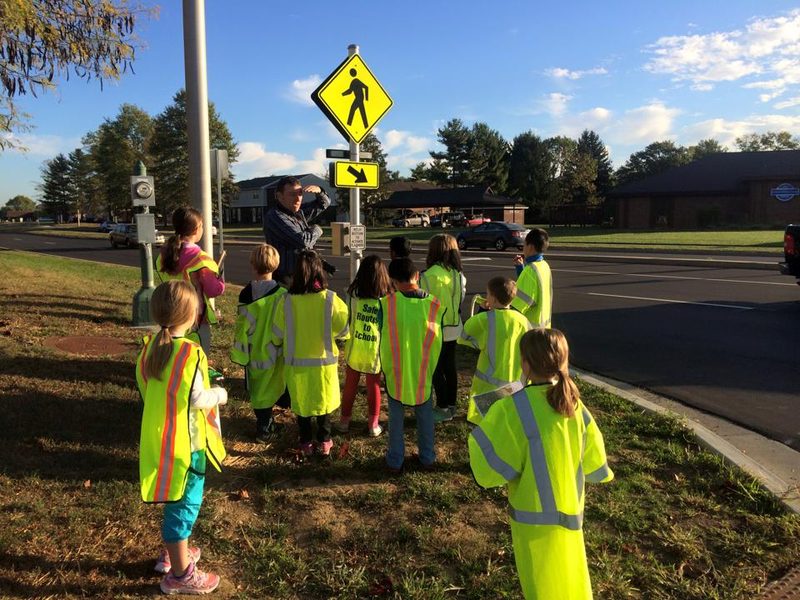 Elementary school students conduct a walk audit in Columbus, Indiana. Photo courtesy Healthy Communities. The 2015 community health needs assessment in Columbus identified key risk factors that are linked with chronic disease. Nearly 40 percent of the population had been diagnosed with high blood pressure, and just under 84 percent have one or more cardiovascular risk factors. The assessment also indicated that only 49 percent of the population gets the recommended amount of daily physical activity. Concerns are even greater for children in the area: over 24 percent of parents reported that their children have three or more hours of daily screen time. The number one health challenge for school children is asthma, followed by diabetes. One component of the Plan4Health project was prioritizing safe routes to school. Over 1,400 children across seven schools participated in a walk and bike to school event as part of WALKtober 2015. Third grade students from Parkside Elementary School also participated in a walking audit with the Walkable and Livable Communities (WALC) Institute. They learned about elements in the street environment that encourage or discourage safe walking and biking. "The Walking Audit was a valuable and educational experience for our 3rd grade students. ... Students quickly became experts by presenting the information to their classrooms and answering questions from curious classmates. ... One stated, ‘It is a good thing we have bike and walking trails! It saves energy, environmental resources, and keeps us healthy and active through exercise!'" Healthy Communities is pursuing efforts to make the Columbus community more conducive to daily physical activity by leveraging the relationships and tools developed through their Plan4Health work. The coalition is prioritizing short-term, mid-range, and long-term recommendations to improve bike and pedestrian friendliness developed by the WALC Institute as part of their Active Living Workshop. This success story was developed in partnership with Laura Garrett, community initiatives lead at Healthy Communities. Top image: Community members participate in a public art walking tour in Columbus, Indiana. Photo courtesy Healthy Communities.